Vladimir Odinokikh began playing the piano at the age of four and received his training at some of Russia’s finest music institutes, including the Tchaikovsky Conservatory and Gnessin Institute of Moscow. Competitions and festivals included the First Rachmaninoff International Piano Competition, the Russia National Competition (Prize), Chamber Music Competition of Soviet Compozers (First Prize), International Ponce-Scriabin Festival, First Bach Festival in Peru, and the Isadora Duncan Festival in England. His reputation as a soloist and chamber musician developed as he performed with leading Soviet artists and presitgious organizations such as the Rosconcert and Moscow Philharmonic. 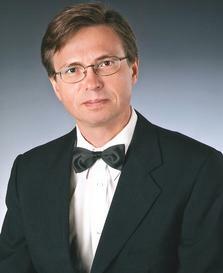 Mr. Odinokikh has performed in the concert halls of Europe, South America, and the United States and with symphony orchestras in Russia and Mexico. "Thank you for the splendid performance of my compositions"
"Vladimir was my accompanist at the recitals in Moscow from 1989-91. Also, we toured a lot through throughout the country. 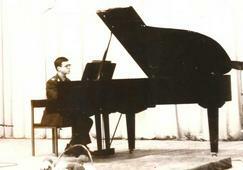 Vladimir during his Army years, following completion of his music studies in Moscow. Early 1980's. "How I Came to the Piano"
Read about the "real" Vladimir: His unique childhood; how he came to the United States via Mexico and other interesting tid bits. Read additional quotes from colleagues and students about what makes Vladimir such a special pianist and teacher. He has also recorded extensively for radio and television in the USSR, Mexico, and the United States. He has received international acclaim and numerous awards for both his solo and collaborative performances, and his interpretation of works by world-famous composer Alfred Schnittke was greatly admired by the composer. Mr. Odinokikh has taught at the Ippolitov-Ivanov College of Music in Moscow, was professor at the Alicia Urreta Center for the Arts in Mexico City, and professor and Artist-in-Residence at the Conservatorio de las Rosas, in Moreolios, Mexico. 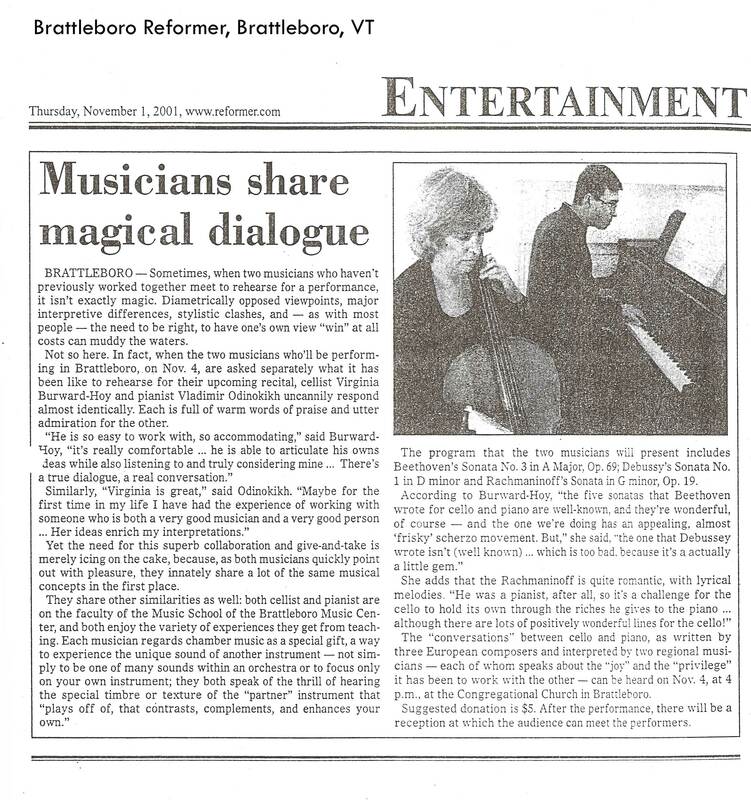 He has taught at the Keene Institute of Music and Related Arts. In addition to maintaining a private piano studio ,Mr. Odinokikh is currently a member of the faculty of Pakachoag Music School of Greater Worcester in Central Massachusetts. Mr. Odinokikh also serves as the Organist/Accompanist at the Keene Unitarian Universalist Church and as accompanist for the Keene Chorale. He was the featured pianist at the Keene Chorale’s 30th Anniversary Celebration at which he played Beethoven’s Choral Fantasy and at the Keene Chorale’s Spring 2011 concert in which he performed two Rachmaninoff compositions. Accepted as one of 20 international participants in the Eastman Young Artist's International Piano Competition (2012), one of only eight American pianists accepted to compete. 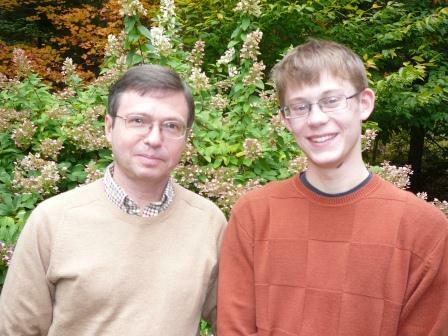 Vladimir with Award Winning Student Miles, Age 17. Recorded live in recital at Palacio de Bellas Artes, Mexico City (just a few days following Schnittke's death in Augut 1998).